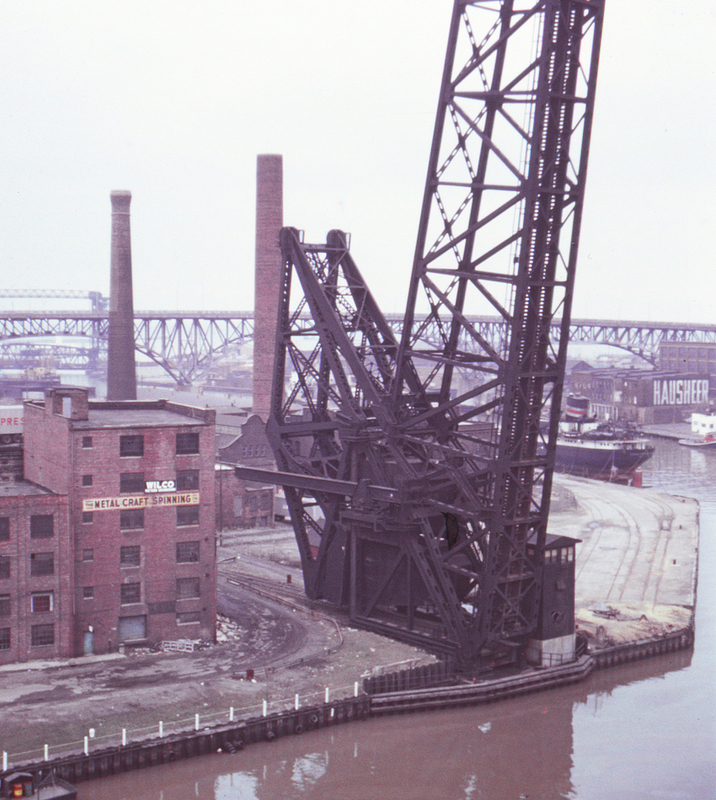 The Cuyahoga River curled through the Cleveland Flats without regard for the railroads' convenience, creating one obstacle after another. The result was a proliferation of bridges like this bascule bridge on the Baltimore & Ohio's line to the lakefront, where it interchanged with the Pennsylvania and New York Central railroads. Both vertical lift bridges and bascule bridges like this one were common. In this view looking north towards Lake Erie from the U.S. Route 20/42 bridge a vertical lift bridge can be seen in the distance at left (where the New York Central crossed the mouth of the river), as well as one of the many lake boats that managed to navigate their way a remarkable distance along the river. The highway bridge soaring over everything is the Main Avenue Viaduct (Ohio State Route 2).